Social Media & Sign Ups: JHD is on Facebook and Twitter, with social media editor Lauren Byrne at the helm. Be sure to follow us and be part of the conversation! If you do not already receive the JHD newsletter, we invite you to sign up to receive notification of new JHD issues, plus other related news. Sign up via this link tiny.cc/JHDsignup & you can read the latest newsletter here. Clinical Trials Corner: This open-access feature was launched in 2017 (JHD 6:3, Sept 2017), with Drs. Edward Wild and Filipe Rodrigues as editors of this section. Read the first instalment here – one of the top 10 most viewed JHD articles of 2017 – or click on the visual on the left for the latest instalment (JHD 8:1, Jan 2019). If you know of any Huntington Disease Clinical Trials that have not been featured, feel free to get in touch. Indexing: Journal of Huntington's Disease is included in PubMed (MEDLINE), the largest component of PubMed. MEDLINE is searchable for free using PubMed at pubmed.gov. Citations and abstracts for articles published in JHD are listed going back to Volume 1/Number 1. 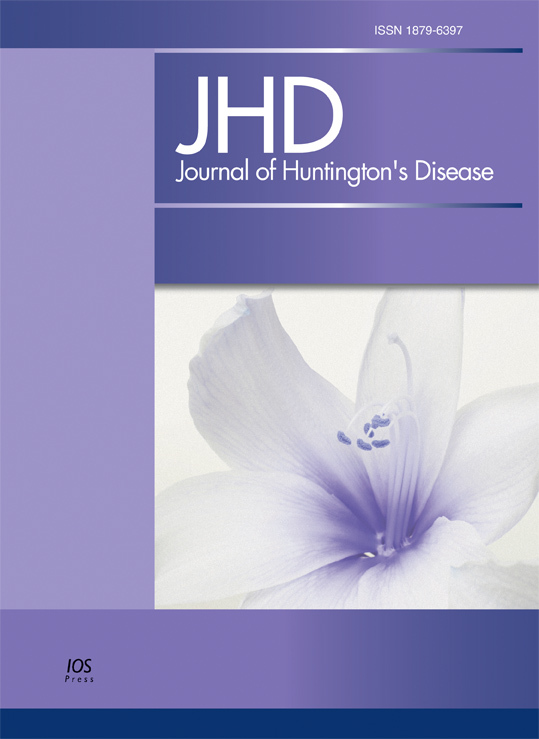 The Journal of Huntington's Disease is an international multidisciplinary journal to facilitate progress in understanding the genetics, molecular correlates, pathogenesis, pharmacology, diagnosis and treatment of Huntington's disease and related disorders. The journal publishes research reports, reviews, short communications, letters-to-the-editor, and will consider research that has negative findings. The journal is dedicated to providing an open forum for original research in basic science, translational research and clinical medicine that will expedite our fundamental understanding and improve treatment of Huntington's disease and related disorders. Note that the manuscript should be uploaded as one file with tables and figures included. This file can be a Word document, a PDF, or an embedded or zip file (.rar) if separate high resolution figures or a supplemental file such as a video are also to be included with the submission (the file size maximum for a video is 25MB). If the video is too large to submit, please contact jhd@iospress.com to arrange a file transfer. For further information about submitting supplementary data click here. 1. Manuscripts must be written in English. Authors whose native language is not English are recommended to seek the advice of a native English speaker, if possible, before submitting their manuscripts. You can also visit Peerwith. Peerwith offers a language and copyediting service to all scientists who want to publish their manuscript in scientific peer-reviewed periodicals and books. 2. Manuscripts should be double spaced throughout with wide margins (2.5cm or 1in), including the abstract and references. Every page of the manuscript, including the title page, references, tables, etc., should include a page number centered at the bottom. 3. Manuscripts should be organized in the following order with headings and subheadings typed on a separate line, without indentation. - For other papers such as Reviews, the abstract should be clear, descriptive, and self-explanatory, and no longer than 250 words. - Include a list of 4-10 keywords. These keywords should be terms from the MeSH database. Authors are requested to use the Vancouver citation style. Place citations as numbers in square brackets in the text. All publications cited in the text should be presented in a list of references at the end of the manuscript. List the references in the order in which they appear in the text. Only articles published or accepted for publication should be listed in the reference list. We discourage textual references to unpublished and unavailable data. With permission, the author can reference a personal communication with name in the discussion section. If an article has a DOI, this should be provided after the page number details. The number is added after the letters 'doi'. Manuscripts will not be considered if they do not conform to the Vancouver citation guidelines. - Number according to their sequence in the text. The text should include references to all tables. - Provide each table on a separate page of the manuscript after the references. - Include a brief and self-explanatory title with any explanations essential to the understanding of the table given in footnotes at the bottom of the table. - Vertical lines should not be used to separate columns. Leave some extra space between the columns instead. - Number the figures according to their sequence in the text. The text should include references to all figures. - Figures should preferably be formatted in TIF or EPS format. JPG is also acceptable. - A description of the statistical treatment of error analysis should be included in the figure or legend. We discourage the use of bar graphs where possible. - Figures should be designed with the format of JHD in mind and preferable sized as they will appear when printed. A single column of the journal is 77mm and two columns are 165mm. - Figures should be at 300 dpi or higher and be cropped to include the figure only (no blank space). CMYK is preferred for color figures. - On figures where a scale is needed, use bar scales to avoid problems if the figure needs to be reduced. - Each illustration should have a brief self-explanatory legend that should be typed separately from the figure in the section of the manuscript following the tables. - Costs for color figures in the print version of the journal are as follows: 1 figure - 650 euro; 2 figures - 900 euro; 3 figures - 1050 euro; 4 figures - 1200 euro; 5 figures - 1350 euro. Cost for each additional color figure will be 150 euro. Color figures are free in the electronic version of the journal. You may opt to send in both black/white figures for print, and color figures for the online PDF (please adjust the figure legend appropriately). A short communication is an article of original scholarship of unusual interest of less than 1500 words (not including references). An abstract of 100 words or less should be included with no subdivison of text into sections. References should be formatted as above. A total of two tables and/or figures are allowed. This will be a section with Pro and Con commentaries on a specific topic of interest to the HD community. Each author will generate a short opinion piece which will have a maximum of 1000 to 2000 words (with one figure and max 15 references) to make the basic argument. Both sets of authors will receive a copy of both articles, and will be given two weeks to generate a short (200 word max.) rebuttal prior to publication. It is recommended that unsolicited authors email a proposal letter and formal academic outline of the discussion to the Editors (at jhd@iospress.com) to assess the topic, before submitting manuscripts. A). relating to a specific issue/case history in HD. Authors can submit commentaries or case reports of 1000 words or less for possible inclusion in the JHD. It is recommended that authors email a proposal letter and formal academic outline of the manuscript to the Editors (at jhd@iospress.com) to assess the topic, before submitting the full manuscript. Commentaries and case reports should include an abstract (100 words max) but no other subdivisions, and should not include more than 15 references and one figure or table. B). a response to a specific article published in JHD. Inclusion in JHD will be based on editorial decision and revision may be requested. Letters relating to a previous article will be shared with the authors of the original article for possible response prior to publication. Letters should not exceed 500 words (excluding references) and should not include more than 5 references and one figure or table. A letter can be signed by no more than three authors. Submit these to jhd@iospress.com. - Name, postal address, phone number and e-mail address of the corresponding author. - Name of an Associate Editor with expertise in the area of the study (if no Associate Editor is suitable, the Editorial Office will handle the submission). - Statement that all authors have contributed to the work, agree with the presented findings, and that the work has not been published before nor is being considered for publication in another journal. - A list of at least 4-6 potential reviewers knowledgeable in the area of the study and potential reviewer conflicts. - Statement that procedures involving experiments on human subjects are done in accord with the ethical standards of the Committee on Human Experimentation of the institution in which the experiments were done or in accord with the Helsinki Declaration of 1975. - Statement that procedures involving experimentation on animal subjects are done in accord with either the guide of the institution in which the experiments were done, or with the National Research Council's guide for the care and use of laboratory animals. - Compliance with guidelines on human experimentation as well as protocol approval by a local Institutional Review Board should be specified. - Compliance with guidelines of animal experimentation as well as protocol approval by the Institutional Animal Care and Use Committee should be specified. - Statement of all financial and material support for this research and any potential conflicts should also be clearly identified in the the acknowledgment and Conflict of Interest sections. If there is no Conflict-of-Interest then still add this statement. A growing number of funding agencies now require that research articles they have funded must be made Open Access. This may be either by mandating deposit in repositories after an embargo period or by stipulating that research is published as Open Access. Publishing in this journal complies with all major funding agency requirements. The Open Access option helps authors to comply with major funder mandates. This option allows authors the choice of paying a fee to make their article publicly available on the journal’s website immediately upon publication. The publisher will also deposit the final, published version of the Open Access article into PubMed Central immediately upon publication. All Open Access articles are published under the terms of the Creative Commons Attribution Non-Commercial License. If requested by the author, Research Councils UK (RCUK) and Wellcome Trust funded Open Access articles will be published under the terms of the Creative Commons Attribution License (CC-BY). An extra fee applies for CC-BY publications. Please click here to lick here to pay the Open Access fee. Authors who do not select Open Access publication may self-archive and post the final manuscript version on their own institution, company or funding agency repositories immediately upon acceptance. Authors that are funded by the NIH, Research Councils UK (RCUK) and Wellcome Trust are welcome to deposit their final manuscript version to PubMed Central (Submission Method C) and Europe PubMed Central immediately upon acceptance. In all cases a publication reference and URL to the journal’s website must be provided on the first page of the manuscript. Alternatively, the author can submit the final published pdf version of the article, which can be ordered from IOS Press. This service costs €100/US$120 and an order form will be sent with the galley proof of the article to the corresponding author. Ordered PDFs will be sent to the author after final publication of the article in an issue. IOS Press holds to no embargo period after final publication. Orders for a PDF of published articles can also be sent to order@iospress.nl. Permissions for use of materials published in JHD Reports (figures, tables, thesis publication) can be requested at publisher@iospress.nl. The corresponding author of a contribution to the journal is entitled to receive 1 author’s copy of the pdf free of charge, unless otherwise stated. Free copies will not be provided for conference proceedings and abstract issues. An order form for reprints, additional journal copies or a non-watermarked pdf file will be provided along with the pdf proof.